While no one wants to entertain the possibility of ever going bankrupt, the reality is that sometimes life can deal a crushing blow to the extent that you find yourself deep in debt and unable to pay back creditors. You can definitely rebuild your credit worthiness over time post-bankruptcy, but the difficult process of achieving a respectable credit rating or re-establishing creditworthiness, need not hinder your truck loan options. Even if you’ve been forced to file for bankruptcy, you can qualify for truck loan credit at reasonable rates. While truck loan rates will generally be a little bit higher than they would be if your credit rating was strong, you’ll still qualify for affordable options that will allow you to get a vehicle and start your career towards a stronger future. At Truck Loan Center, a division of RB Leasing, we specialize in helping people who have experienced bankruptcy, who have less than favorable credit, or who have zero credit history. We’ll be in your corner and will thoroughly explain your loan options and rates that you qualify for. As our goal is to build a mutually beneficial relationship with our customers, we will endeavor to get you the truck loan credit you need to drive off of the lot with the truck you need. Although it may be tempting to take the first truck loan offered to you after bankruptcy, it’s important that you explore your options. While it is hard work to rebuild your credit worthiness after filing for bankruptcy, the process can be made all the more difficult since some loan providers all but blacklist anyone who has ever filed for bankruptcy. On the flip side, there are companies that use this to their advantage, offering incredibly and unfairly high rates to people they know could not otherwise get a loan. However, at Truck Loan Center, we will go to bat for you and will provide options for truck loan credit with attractive truck loan rates. When it comes to getting a truck loan after bankruptcy, you want a transparent process that you can trust. At the Truck Loan Center, we have helped hundreds of customers- including those who have previously filed for bankruptcy- to get truck loan options that they are satisfied with. We have a process in place that is transparent, and you’ll know where things stand at each stage of the process. Bankruptcy won’t eliminate your chances of getting truck loan credit. 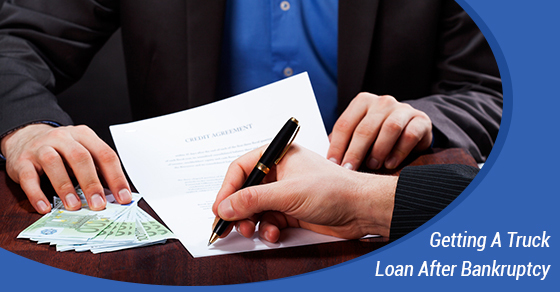 In order to get the loan application process started, contact us today for a free initial consultation!